Though, the researcher said he could've simply "gotten lucky" with the results. Doctors are struggling to combat infections that have developed resistance to many antibiotics. Considering that antibiotic-resistant bacteria infect 2 million Americans annually — and kill 23,000 — researchers are turning to alternative means of fighting these sometimes deadly infections. One such alternative weapon could be bacteriophages (or phages), viruses that are adept at infecting specific types of bacteria. Benjamin Chan, an associate research scientist in the department of Ecology and Evolutionary Biology at Yale University, has provided a glimpse of how phages might be used to combat infections. According to Motherboard, Chan used a phage found in Dodge Pond, Connecticut in an attempt to cure a patient living with an antibiotic-resistant infection in his chest. With the assistance of doctors from the Yale School of Medicine, Chan introduced the phage — coupled with an antibiotic — to the man’s chest. By their very nature, phages are only compatible with the bacterial host they attach themselves to, ultimately meaning they can’t infect humans. 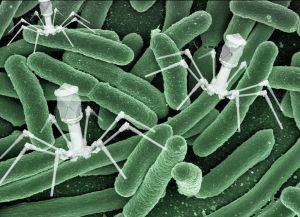 As explained in Chan’s case study, now published to the journal Evolution, Medicine, and Public Health, the phage he and his colleagues introduced to the infected area turned out to be an exact match for the bacteria. The patient hasn’t seen signs of an infection in more than a year and a half. There are a few caveats that should be noted, though. Chan’s case study recounts the results of a single study with a single patient, and can’t be used as proof of phage therapy’s potential for all patients. More trials are needed to provide any conclusive evidence. Chan later told Motherboard they could have simply “gotten lucky” with the positive results. That said, Chan’s research also revealed that the phage can also make the bacterial infection more susceptible to antibiotics. Chan’s phage therapy may not be a one-off for long, though. He told Motherboard that he has been contacted by multiple people who want to try the therapy themselves instead of antibiotic treatment. The tests will need funding, but if Chan can get it, it’ll get us one step closer to fighting back against antibiotic-resistant viruses.